President Obama speaking at Havana's Gran Teatro on Tuesday. HAVANA - Shortly after Barack Obama’s historic speech in Havana Tuesday morning, I met a smart, 34-year-old Cuban accountant named Kariel González in the Vedado district. He’d listened to President Obama on the radio, and he was cheering the U.S. leader's last line – ¡Sí Se Puede! – a Spanish rendering of his iconic campaign slogan, Yes We Can! González said he'd already heard Cubans repeat the soundbite on the sidewalks. “It’s the sort of thing that makes Obama so popular on the island,” he told me. What he meant was: ¡Sí Se Puede! is a hell of a lot cooler mantra than the dreary, Soviet-style mottos Cuba’s communist leaders have slathered on billboards and airwaves for half a century. Such as ¡Socialismo O Muerte! – Socialism Or Death! Now there’s a political jingle for the GroupMe generation! Obama’s sign-off seemed to embolden Cubans like González to praise, out loud, the meatier content of the address – including Obama's remarkably direct call to Cuba’s President Raúl Castro to adopt democratic reforms. Yet González himself isn’t what you’d call a dissident. He still admires certain aspects of the revolution as much as he now admires Obama. As we said goodbye, I asked him, since he likes radio, if he’d ever listened to Radio Martí – the U.S.-funded, Cuban exile-run broadcaster that transmits into Cuba. Having a magnetic American president making pro-democracy points inside Havana is more effective than beaming in tired anti-communist pamphleteering from Miami. And there’s why Obama was right 15 months ago when he said it was time for the U.S. to try something besides isolating Cuba – and why his visit to the country, the first by a U.S. president in 88 years, was so important. No one denies Cuban exile anger is justified. But if you want the U.S. to influence change in Cuba, it seems more effective to have a magnetic American president making pro-democracy points in Havana. It's at least more effective than beaming in tired anti-communist pamphleteering from Miami. That couldn’t have been more obvious on Monday, when Obama and Castro held one of the more awkward press conferences in hemispheric history. The day before, I'd watched Castro’s police round up some 50 dissidents for holding their weekly street demonstration in Havana’s Miramar district. It left Obama no choice but to address the human rights elephant in the room – and let U.S. journalists prod Castro into addressing it too. Which the 84-year-old leader did in almost doddering fashion. 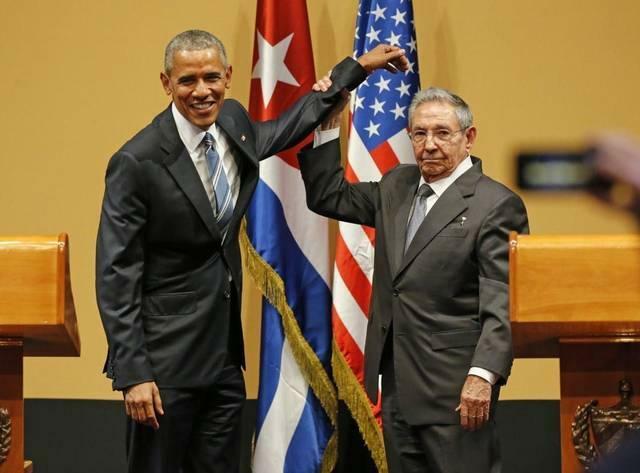 Obama and Cuban President Raul Castro at their Monday press conference in Havana. It almost certainly made Cuba’s revolutionary dinosaurs cringe in their military fatigues. Because it was just that stark contrast – a youthful, forward-looking Obama skating diplomatic figure eights around an entrenched, geriatric Castro – that Cuba’s communist leaders feared most about Obama’s visit. And, most of all, about his speech. Obama’s biggest oratorical challenge was to navigate the Florida Straits between conciliatory outreach and critical shout-out. To extend a "white rose,” as he said in his opening line, quoting Cuban poet and independence hero José Martí, but one that still bore some thorns of bilateral disagreement. And by most accounts he did so masterfully. He did it by urging the U.S. Congress to lift the trade embargo – which he called “an outdated burden on the Cuban people” – while pointing out that authoritarian red tape continues to choke Cuba's economic and entrepreneurial potential. He did it by praising revolutionary achievements like free schooling and doctoring – which Castro rightly identifies as human rights too – while reminding Cubans that the marketplace of ideas, so muffled in their country, has led to achievements in the U.S. like the Internet, civil rights and Obama’s election as the first black president. It will still take quite a while for Cubans to see the change Obama waxed about. But before his visit it really did seem to many of them that their only option was “socialism or death.” Or leaving. On Tuesday morning something vastly different got beamed in. And it wasn’t boring, man. It's fairly apparent that President Obama's historic speech to Cubans yesterday was received positively on the island. Obama called for democracy, free expression and a freer economy during his 35-minute speech at the Gran Teatro in Old Havana Tuesday morning. Obama even directly addressed Cuban leader Raúl Castro, who was in the audience, telling him the U.S. presidential visit means he no longer needs to fear Cuba's Cold War foe. "I have come here to bury the last remnant of the Cold War in the Americas," Obama declared in perhaps the linchpin line of his speech.